Is seven your lucky number? Now it can be, for this online video slot from Play’n GO will enchant 7 bonus features and pristine graphics. Wild North is set in the Scandinavian wilderness and can be played on any device from as little as €0.40. As the 5 reels and 3 rows, be on the lookout for the 40 paylines as well as any of the 7 bonus features – Mega Symbols, Wild Reels, stacked symbols, multipliers of up to 30x, 2×2 Symbols, Free Spins and the Northen Lights bonus game. Running Reindeer – you get 1Free Spin with a Reindeer symbol stacked on reels 2, 3, and 4. If you land them on reels 2, 3 and 4 or if they form a 3×3 block, you will be granted an extra re-spin and the wilds will turn sticky. 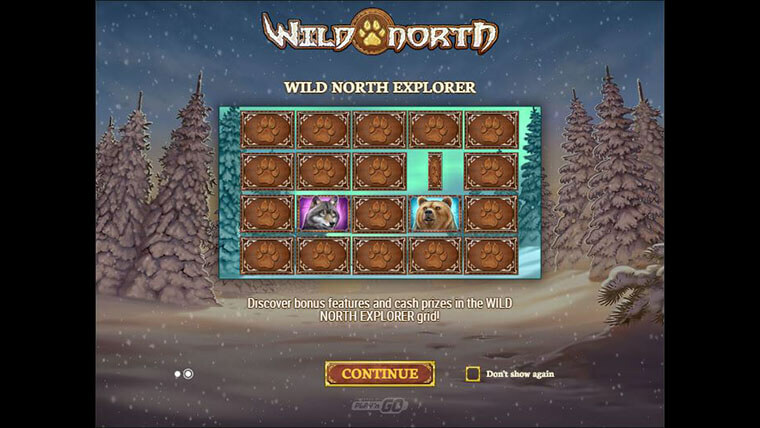 Wild North Explorer – a 20 tile grid from which you can pick and reveal either instant cash prizes, or any of the Free Spins bonuses described so far. You get to pick until you reveal an ‘X’ or The Great Wilderness or Wild Lynx features.